Happy ground school students surround their instructor, Captain Judy Rice. Epic Flight Academy offers a step-by-step process for becoming a pilot. After being accepted as an Epic flight cadet, the first course you will take is Ground School. Classes are held for 8 weeks in the main classroom at Epic Flight Academy for 2.5 hours per day, Monday through Friday. Epic’s Private Pilot Pilot Course Ground School is taught in conjunction with our Virtual Flight Academy and Aviation Skills Development simulator instruction. It is literally taught “on the ground” instead of “in the airplane,” which is why it’s called “Ground School.” During this time, however, you will also take flight lessons, so you will be able to apply what you’re learning in the classroom in the airplane. We believe in teaching theory and practice at the same time. Learning aircraft terminology and concepts from the textbook is important, but it’s also important to experience these things firsthand. Ground School provides the basic knowledge you need to become a licensed pilot, so it covers a broad range of topics. Whether you’re a domestic student or an international student, you’ll want to learn the best study skills, which we teach you. Because the course is only 8 weeks long, you will want to make the most of every day. So, after class, you will want to review and practice the material we’ve covered. In Ground School, we teach the basics of aircraft systems, instruments, aerodynamics, Federal Aviation Regulations (FARs), aeronautical decision-making, aeromedical factors, airport operations, airspace, weather theory, services, aircraft performance, weight & balance, and navigation. You will learn to read sectional charts, NOTAMS (Notice to Airmen), weather charts, runway diagrams, and other important documents. Another important component of Ground School classes is preparing for your FAA tests. We will help you study and prepare for these important milestones. Epic’s Ground School provides the foundation that ensures your flight training success. While attending Ground School, you can also receive additional instructional support if needed, such as one-on-one ground school instruction covering specific topics. For international students, we can also provide English tutoring to support your Aviation English skills, if needed. Once you successfully complete your pilot training at Epic, you are certified by the FAA (Federal Aviation Administration) to IACO (International Civil Aviation Organization) Level IV English. We welcome students of all nationalities. Aviation connects the world! We have found that our students are here because they have a dream to become a pilot, and we love teaching people how to fly! With your enthusiasm and our knowledge, you will learn the Ground School material quickly. All of our instructors are highly qualified not only in aviation, but also in teaching methods. They use every excellent educational strategy to make learning easy. We take great pride in our students’ success rates, which is why you will never be just a face in a classroom. We get to know you personally and become a true partner in your success. When you pass your FAA written exam, we are right there to celebrate with you! Captain Judy Rice has had a life-long passion for aviation and aerospace technology. This interest and sixteen years in formal education eventually brought her into the field of aerospace education. She values the experience gained as a teacher in special education because it gave her a broad knowledge of the learning process. Captain Rice has visited over 100 countries and all of the United States, including Alaska and Hawaii. 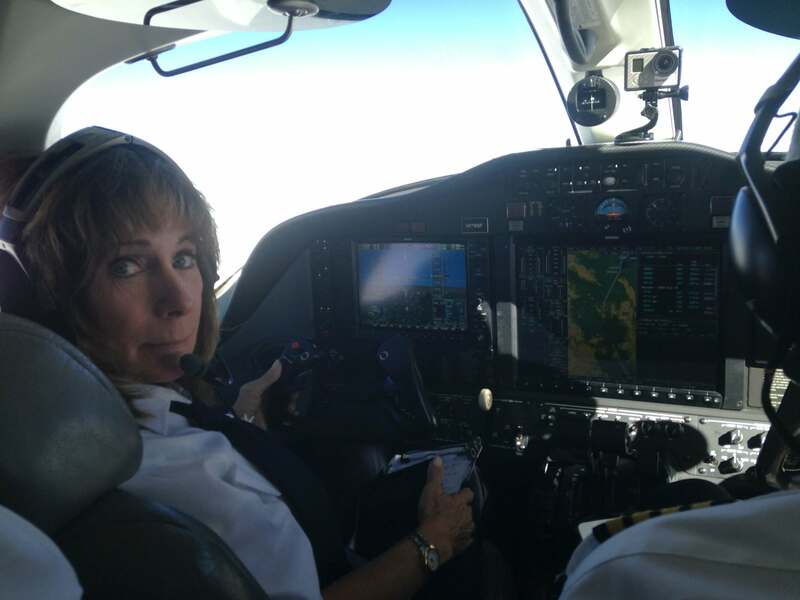 In 2015, she successfully piloted a Citation Mustang around the world visiting over 10,000 students in 35 countries. She is an instrument rated, commercial, multi-engine, Citation type-rated pilot, an advanced ground instructor, a Certified Flight Instructor, and has logged more than 3,000 hours in numerous aircraft. She is the owner of a Grumman Yankee airplane. Rice’s portfolio includes numerous awards and accomplishments, most recently a world speed record. She is a member of many aviation and space organizations. Other than flying, her favorite way to spend her time is to assist Epic Flight Academy students reach their goals. She is proud to be part of the Epic family – and Epic is proud to have her on our team! After you complete Ground School, your Private Pilot License training continues with your Certified Flight Instructor. You are on your way!